Thousands of people have gathered in Grozny to show their support for Ramzan Kadyrov, the head of the Chechen republic, whose statements about the ‘non-system’ Russian opposition have recently drawn significant criticism from political liberals. The number of participants was reported as over 700,000 – about half of Chechnya’s 1.38 million population. 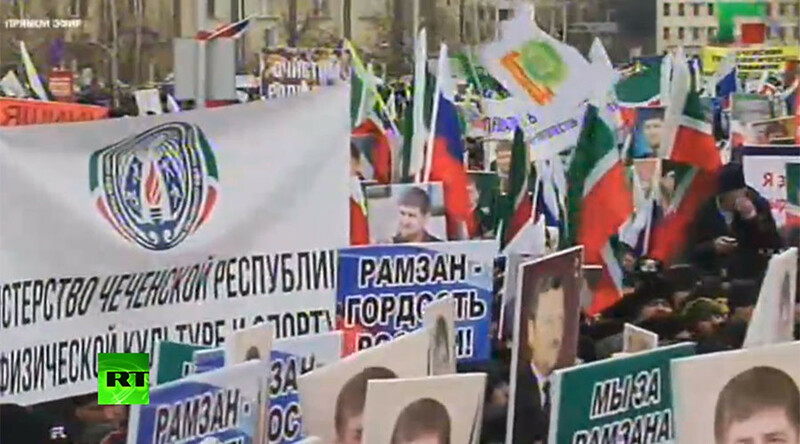 Many of the demonstrators held posters with Ramzan Kadyrov’s portrait and slogans showing support for him and Russian President Vladimir Putin. Many were also carrying Russian flags. Some slogans blasted Kadyrov’s critics as “traitors” and “fifth column,” and accused them of serving foreign interests, in particular those of the United States. This immediately drew criticism from several politicians and human rights activists, who said Kadyrov’s words could be taken as a threat. The Intelligentsia Congress group released a letter calling for Kadyrov’s immediate resignation as head of the Chechen Republic. About 10,000 people signed the letter when it was published online, and members of the Presidential Human Rights Council promised to raise the issue with the Kremlin. Many of the slogans at Friday rally blasted Russian opposition politician Ilya Yashin, and called for his exile from the country. Yashin, who is the deputy chairman of the People’s Freedom Party, has promised to present a major report portraying Kadyrov as a threat to Russia. He told reporters that the paper would concentrate on the Chechen leader’s unaccountability before federal authorities, as well as alleged corruption and nepotism in the republic. The politician promised the report will be released in late February. However, Chechen officials, like the republic’s plenipotentiary for human rights, Nurdi Nukhazhiyev, said that Kadyrov’s comments only applied to those who have targeted Russia’s national security, and not to all political opposition. The last mass rally in Grozny took place in January 2015, after Ramzan Kadyrov condemned the French satirical magazine Charlie Hebdo for releasing cartoons portraying Prophet Muhammad, and called on Chechens and other Muslims to show their support for Islam. 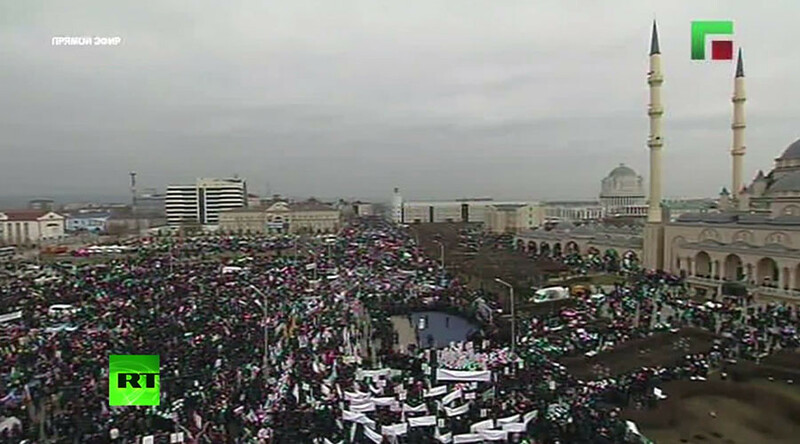 According to the Chechen Interior Ministry, about 1 million people took part in that rally. On Friday afternoon Kadyrov thanked all the participants of the support rally with an Instagram post (often the leader’s preferred medium for posting public addresses and other publicity materials). “I want to express my sincere gratitude to everyone who took part in the mass rally. It showed that we are united in our struggle for peace and political unity in Russia,” he wrote. “Because of Russia’s enemies we have had to go through a bloody tragedy, but we found strength to defeat the countless gangs of Western special services and restore peace. Hundreds of thousands of people from various regions of Russia offered a resolute rebuff to renegades who have sold out to the West and who have but a single goal – to immerse Russia into chaos and subject it to the will of the United States and its allies,” the Chechen leader wrote. “But this will never happen!” he concluded.